Pink Preppy Party Girl left me a sweet comment yesterday stating "...my parents are having a 50th party. I would love some inspiration from you. Gold and brown is one direction but would love your creative touch including invitation suggestions". 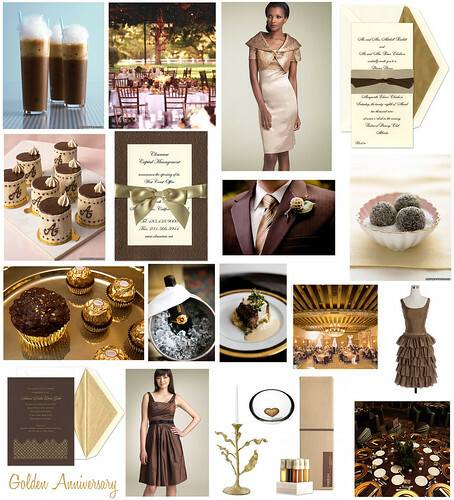 Always happy to help, I put together this inspiration board for a glamourous golden anniversary, complete with deep chocolates, brilliant bronzes and glimmering golds. - don't forget the champagne! If you're stuck on a party theme or just need a little bit of inspiration, feel free to email or comment and I will do what I can to help you plan the perfect party. Cheers!